Discovered as a sixteen-year-old dancer living in the Maningrida Mission in 1969, David Gulpilil’s breakthrough performance in Nicholas Roeg’s Walkabout remains one of the most iconic and compelling performances of all time. 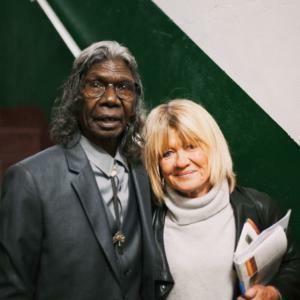 Gulpilil’s films are a roll call of some of the most renowned works in Australian cinema history, including the two highest grossing Australian films of all time, Crocodile Dundee (1986) and Australia (2008). 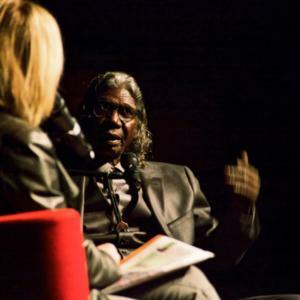 Following Walkabout and numbers of appearances in the television series Boney (1971, 1972), Gulpilil starred alongside Dennis Hopper in Mad Dog Morgan (1976), in the AFI Best Film winner Stormboy (1976), and in the Peter Weir thriller, The Last Wave (1977). More recently he has appeared in Philip Noyce’s Golden Globe® nominated Rabbit Proof Fence (2002), Catriona Mckenzie’s Satellite Boy (2012) and John Hillcoat’s The Proposition (2005) which screened at both the Sundance and Toronto International Film Festivals. In 2000 Gulpilil was cast in his first lead role by filmmaker Rolf de Heer in The Tracker (2002). Thus began a creative collaboration and friendship which is ongoing. Set in the latter days of European colonisation of Australia, The Tracker screened In Competition at the Venice Film Festival and was awarded the Special Jury Prize at the Valladolid Film Festival. 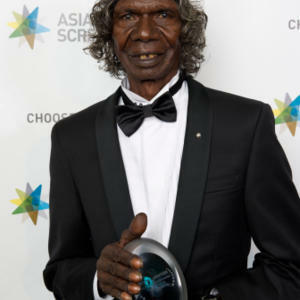 Gulpilil himself won every significant Australian best actor award for his portrayal of the enigmatic tracker. De Heer and Gulpilil next worked together with the community near Gulpilil’s traditional homeland, Ramingining, Arnhem Land, in creating Ten Canoes. The ‘story within a story’ was set in a time long before the arrival of colonial invaders and was the first film to be shot entirely in Australian Aboriginal languages, with Gulpilil performing an off-screen role as The Storyteller. After receiving the Cannes Un Certain Regard Special Jury Prize, Ten Canoes was selected for the Toronto International Film Festival and went on to become an Australian Box Office success and the winner of the Best Film award at all three of Australia’s national film awards, the AFIs, IF Awards and FCCA Awards. In 2014 Gulpilil co-wrote the script and played the title role in Rolf de Heer’s Charlie’s Country,giving a performance which Screen International said ”crowns his career”. For his mesmerising portrait of Charlie, Gulpilil was awarded the Best Actor in Un Certain Regard by Cannes, and in Australia by the AACTA Awards and the Australian Film Critics Association. Gulpilil also won a Special Mention at the 8th Asia Pacific Screen Awards. In 2015 Gulpilil narrated the feature documentary Another Country (2015), co-writing the film with writer/producer Rolf de Heer and writer/producer/director Molly Reynolds. The film will have its world premiere at the Melbourne International Film Festival. Most recently David completed filming a role in Ivan Sen’s Goldstone. David is not just a screen actor, however. He was a peerless dancer, for a time perhaps the most renowned traditional dancer in Australia. He has written the text for two volumes of children's stories based on his people's beliefs. He has performed a one-man autobiographical show to great acclaim on the stages of the Adelaide Festival of Arts and Sydney's Belvoir Street Theatre. And he paints, in his own distinct but traditionally evolved style, paintings which convey his reverence for the landscape, people and traditional culture of his homeland. In 1987 David was awarded the Australia Medal for his services to the Arts and in 2013 he was awarded the Red Ochre Award, which pays tribute to an Aboriginal or Torres Strait Islander artist who, throughout their lifetime, has made outstanding contributions to the recognition of Aboriginal and Torres Strait Islander arts, both nationally and internationally.